Reading and share top 57 famous quotes and sayings about Relativity by famous authors and people. 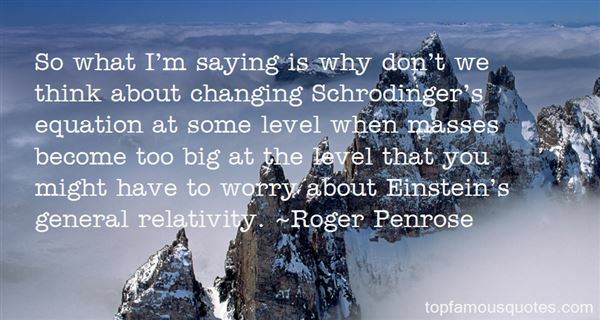 Browse top 57 famous quotes and sayings about Relativity by most favorite authors. 1. "Whatever God felt about anything, He still feels. Whatever He thought about anyone, He still thinks. Whatever He approved, He still approves. Whatever He condemned, He still condemns. Today we have what they call the relativity of morals. But remember this God never changes. Holiness and righteousness are conformity to the will of God. And the will of God never changes for moral creatures." 2. "In determining relationships we must begin somewhere. There must be somewhere a fixed center against which everything else is measured, where the law of relativity does not enter and we can say "IS" and make no allowances. Such a center is God. When God would make His Name known to mankind He could find no better word than "I AM." When He speaks in the first person He says, "I AM"; when we speak of Him we say, "He is"; when we speak to Him we say, "Thou art." Everyone and everything else measures from that fixed point. "I am that I am," says God, "I change not." 3. "One of the most exciting things about dark energy is that it seems to live at the very nexus of two of our most successful theories of physics: quantum mechanics, which explains the physics of the small, and Einstein's Theory of General Relativity, which explains the physics of the large, including gravity." 4. 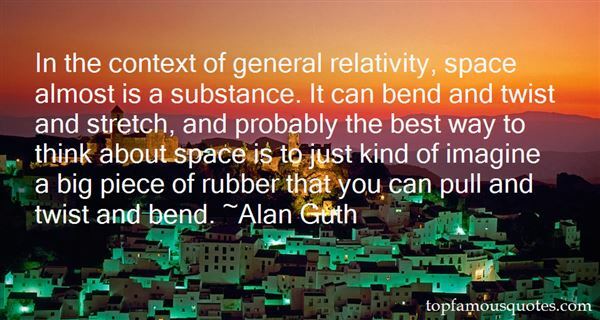 "In the context of general relativity, space almost is a substance. It can bend and twist and stretch, and probably the best way to think about space is to just kind of imagine a big piece of rubber that you can pull and twist and bend." 5. "When you are courting a nice girl an hour seems like a second. When you sit on a red-hot cinder a second seems like an hour. That's relativity." 6. "If my theory of relativity is proven successful, Germany will claim me as a German and France will declare me a citizen of the world. Should my theory prove untrue, France will say that I am a German, and Germany will declare that I am a Jew." 7. "The vanity of existence is revealed in the whole form existence assumes: in the infiniteness of time and space contrasted with the finiteness of the individual in both; in the fleeting present as the sole form in which actuality exists; in the contingency and relativity of all things; in continual becoming without being; in continual desire without satisfaction; in the continual frustration of striving of which life consists. . . Time is that by virtue of which everything becomes nothingness in our hands and loses all real value." 8. "Asked in 1919 whether it was true that only three people in the world understood the theory of general relativity, [Eddington] allegedly replied: 'Who's the third?" 9. "When the fact that one is a total nonentity who's done nothing more outstanding than eating, sleeping, and chatting with neighbors becomes a fact worthy of pride, of announcement to the world and of diligent study by millions of readers – the fact that one has built a cathedral becomes unrecordable and unannounceable. A matter of perspectives and relativity. The distance permissible between the extremes of any particular capacity is limited. The sound perception of an ant does not include thunder." 10. "Accelerating to speeds faster than light was, of course, impossible. General relativity had made that clearenough back in the twentieth century. However, since then a number of ways of circumventing the speedlimit had turned up; by now, there were at least six different known methods of moving mass orinformation from A to B without going through c."
11. "There is no Jesus without Judas, no Martin Luther King, Jr., without the Klan; no Ali without Joe Frazier; no freedom without tyranny. No wisdom exists that does not include perspective. Relativity is the greatest gift." 12. "He started by selling his Porsche Boxster and buying a Toyota Prius in its place.4 "I don't want to live the life of a Boxster," he told the New York Times, "because when you get a Boxster you wish you had a 911, and you know what people who have 911s wish they had? They wish they had a Ferrari." That's a lesson we can all learn: the more we have, the more we want. And the only cure is to break the cycle of relativity." 13. "In relativity, movement is continuous, causally determinate and well defined, while in quantum mechanics it is discontinuous, not causally determinate and not well defined." 14. "Each of us has our own unit of measurement, our own relativity. Spaces between loves. Spaces between destinations. Spaces between deaths." 15. "Because that was the problem, really, wasn't it, with being human? You couldn't just be, couldn't just live and exist without dragging your feet through the mud. You had to communicate, congregate, collaborate, cohabiate. You had to corroborate. Copulate. You had to co-this, co-that, co—bloody-everything, and if you weren't co-operating you were operating with the co, which was a declaration less of independence than of relativity. You could only really exist in relation to others." 16. 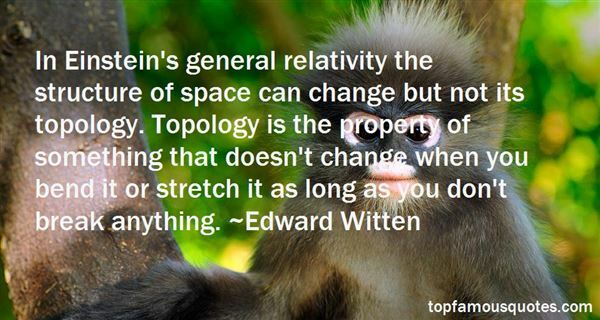 "In Einstein's general relativity the structure of space can change but not its topology. Topology is the property of something that doesn't change when you bend it or stretch it as long as you don't break anything." 17. "I think a strong claim can be made that the process of scientific discovery may be regarded as a form of art. This is best seen in the theoretical aspects of Physical Science. The mathematical theorist builds up on certain assumptions and according to well understood logical rules, step by step, a stately edifice, while his imaginative power brings out clearly the hidden relations between its parts. A well constructed theory is in some respects undoubtedly an artistic production. A fine example is the famous Kinetic Theory of Maxwell. ... The theory of relativity by Einstein, quite apart from any question of its validity, cannot but be regarded as a magnificent work of art." 18. "If Relativity Theory kills our deepest convictions, why not start by finding out why we believed in them for millennia?" 19. "Subjectivity is strange to Science, while Relativity is an objective part of it." 20. "The notion of Local Inertial Frame is crucial to understanding Nature and, in particular, General Relativity. Notwithstanding, very few popular science books (not even textbooks) emphasize enough its fundamental character." 21. "As we already pointed out, 'special' means 'restricted to Inertial Frames of Reference', i.e. this theory cannot describe the Universe from an arbitrary reference frame. This restricted scope is not to be ignored, though not overemphasized either. ...Ironically, and precisely because of the great success of this simple version of Relativity Theory, most of its detractors have chosen to ignore (out of ignorance or malice -- you judge case by case) its philosophical foundation and restriction to Inertial Frames, so as to declare it invalid." 22. "After some cogitation, it is difficult not to agree with Herman Bondi (1919 - 2005), who in his book 'Relativity and Common Sense' says:... The surprising thing, surely, is that molecules in a gas behave so much as billiard balls, not that electrons behave so little like billiard balls." 23. "The velocity of light is one of the most important of the fundamental constants of Nature. Its measurement by Foucault and Fizeau gave as the result a speed greater in air than in water, thus deciding in favor of the undulatory and against the corpuscular theory. Again, the comparison of the electrostatic and the electromagnetic units gives as an experimental result a value remarkably close to the velocity of light–a result which justified Maxwell in concluding that light is the propagation of an electromagnetic disturbance. Finally, the principle of relativity gives the velocity of light a still greater importance, since one of its fundamental postulates is the constancy of this velocity under all possible conditions." 24. "Scientists, therefore, are responsible for their research, not only intellectually but also morally. This responsibility has become an important issue in many of today's sciences, but especially so in physics, in which the results of quantum mechanics and relativity theory have opened up two very different paths for physicists to pursue. They may lead us - to put it in extreme terms - to the Buddha or to the Bomb, and it is up to each of us to decide which path to take." 25. "Should a priest reject relativity because it contains no authoritative exposition on the doctrine of the Trinity? Once you realize that the Bible does not purport to be a textbook of science, the old controversy between religion and science vanishes . . . The doctrine of the Trinity is much more abstruse than anything in relativity or quantum mechanics; but, being necessary for salvation, the doctrine is stated in the Bible. If the theory of relativity had also been necessary for salvation, it would have been revealed to Saint Paul or to Moses." 26. "In Hamilton's The Universe Wreckers... it was in that novel that, for the first time, I learned Neptune had a satellite named Triton... It was from The Drums of Tapajos that I first learned there was a Mato Grosso area in the Amazon basin. It was from The Black Star Passes and other stories by John W. Campbell that I first heard of relativity.The pleasure of reading about such things in the dramatic and fascinating form of science fiction gave me a push toward science that was irresistible. It was science fiction that made me want to be a scientist strongly enough to eventually make me one.That is not to say that science fiction stories can be completely trusted as a source of specific knowledge... However, the misguidings of science fiction can be unlearned. Sometimes the unlearning process is not easy, but it is a low price to pay for the gift of fascination over science." 27. "One looks forward to the day when the General Theory of Relativity and the Principia will outsell the Kama Sutra in back-street bookshops." 28. "Reality becomes illusory and observer-oriented when you study general relativity. Or Buddhism. Or get drafted." 29. "Our stereotyping societies force us to feel more alone. They stamp masks on us and isolate out real selves. We all live in two worlds: the old comfortable man-centred world of absolutes and the harsh real world of relatives. The latter, the relativity reality, terrifies us; and isolates and dwarfs us all." 30. "Each pleasure we feel is a pleasure less; each day a stroke on a calendar. What we will not accept is that the joy in the day and the passing of the day are inseparable. What makes our existence worthwhile is precisely that its worth and its while - its quality and duration - are as impossible to unravel as time and space in mathematics of relativity." 31. "Evolution is among the most well-established theories in the scientific community. To doubt it sounds to biologists as absurd as denying relativity does to physicists." 32. "Einstein, in the special theory of relativity, proved that different observers, in different states of motion, see different realities." 33. "My sense of religion is Einstein's sense of relativity. I don't believe in God. I believe that energy never dies. So the possibility exists that you might be breathing in some other form of Moses or Buddha or Muhammad or Bobby Kennedy or Roosevelt or Martin Luther King or Jesus." 34. "Everyone has learning difficulties, because learning to speak French or understanding relativity is difficult." 35. "I have tried to read philosophers of all ages and have found many illuminating ideas but no steady progress toward deeper knowledge and understanding. Science, however, gives me the feeling of steady progress: I am convinced that theoretical physics is actual philosophy. It has revolutionized fundamental concepts, e.g., about space and time (relativity), about causality (quantum theory), and about substance and matter (atomistics), and it has taught us new methods of thinking (complementarity) which are applicable far beyond physics." 36. "The Theory of Relativity confers an absolute meaning on a magnitude which in classical theory has only a relative significance: the velocity of light. The velocity of light is to the Theory of Relativity as the elementary quantum of action is to the Quantum Theory: it is its absolute core." 37. "Physics is at present a mass of partial theories which no man has yet been able to render truly and clearly consistent. It has been well said that the modern physicist is a quantum theorist on Monday, Wednesday, and Friday and a student of gravitational relativity theory on Tuesday, Thursday, and Saturday. On Sunday he is praying. . . that someone will find the reconciliation between the two views." 38. "General relativity is the cornerstone of cosmology and astrophysics. It has also provided the conceptual basis for string theory and other attempts to unify all the forces of nature in terms of geometrical structures." 39. "The birth of science as we know it arguably began with Isaac Newton's formulation of the laws of gravitation and motion. It is no exaggeration to say that physics was reborn in the early 20th-century with the twin revolutions of quantum mechanics and the theory of relativity." 40. "Some years ago I read a book that brought Einstein's theory of relativity down to an eighth grade level. This convinced me that any subject can be made easy. In other words, always beware of anyone who tells you a topic is above you or better left to experts. This person may, for some reason, be trying to shut you out. You CAN understand almost anything." 41. "Relativity and quantum mechanics have demonstrated clearly that what you find out with instruments is true relative only to the instrument you're using, and where that instrument is located in space-time. So there is no vantage point from which ‘real' reality can be seen; we're all looking from the point of view of our own reality tunnels." 42. "So what I'm saying is why don't we think about changing Schrodinger's equation at some level when masses become too big at the level that you might have to worry about Einstein's general relativity." 43. "Einstein was searching for String Theory. It not only reconciles General Relativity to Quantum Mechanics, but it reconciles Science and the Bible as well." 44. "Quantum Mechanics and General Relativity are both accepted as scientific fact even though they're mutually exclusive. Albert Einstein spent the second half of his life searching for a unifying truth that would reconcile the two." 45. "Einstein's paper on the photoelectric effect was the work for which he ultimately won the Nobel Prize. It was published in 1905, and Einstein has another paper in the very same journal where it appeared - his other paper was the one that formulated the special theory of relativity. That's what it was like to be Einstein in 1905; you publish a groundbreaking paper that helps lay the foundation of quantum mechanics, and for which you later win the Nobel Prize, but it's only the second most important paper that you publish in that issue of the journal." 46. "The truth can only be absolute as any relativity may include the untruth towards the system of reference where it varies." 47. "I heard that in relativity theory, space and time are the same thing. Einstein discovered this when he kept showing up three miles late for his meetings." 48. "We are all glorified motion sensors.Some things only become visible to us when they undergo change.We take for granted all the constant, fixed things, and eventually stop paying any attention to them. At the same time we observe and obsess over small, fast-moving, ephemeral things of little value.The trick to rediscovering constants is to stop and focus on the greater panorama around us. While everything else flits abut, the important things remain in place.Their stillness appears as reverse motion to our perspective, as relativity resets our motion sensors. It reboots us, allowing us once again to perceive.And now that we do see, suddenly we realize that those still things are not so motionless after all. They are simply gliding with slow individualistic grace against the backdrop of the immense universe.And it takes a more sensitive motion instrument to track this." 49. "In 1905 Albert discovered Relativity, in 1906 he invented Rock and Roll." 50. "The total number of people who understand relativistic time, even after eighty years since the advent of special relativity, is still much smaller than the number of people who believe in horoscopes." It's not denial. I'm just selective about the reality I accept."